Terrarium snails are easy pets to keep. They're low-maintenance animals that are easy to please and can even enjoy being handled. 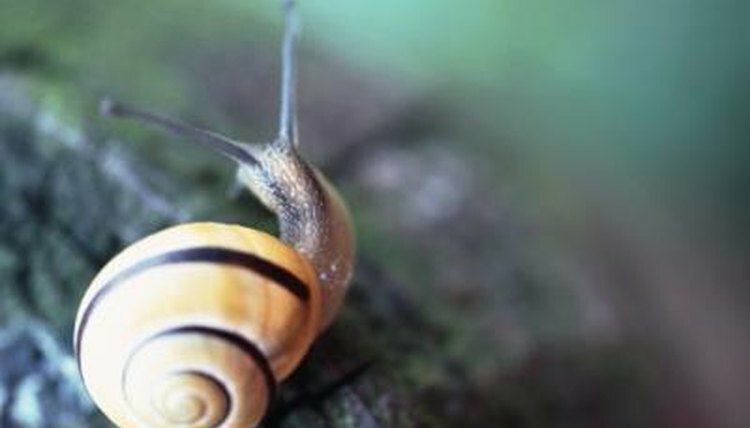 Many species of terrestrial snail can be found in your garden or through exotic pet dealers and scientific supply companies. A snail terrarium is simple to set up and maintain. Various species of land snails can be found in the wild and will easily adapt to life in a terrarium. For example, the common brown garden snail, Cornu aspersum, originates from Europe but has propagated in North America since the 1850s. Snails in the genus Carychium and Cochlicopa can be found in many states throughout the U.S. and have vertically spiraled, pointed shells resembling a unicorn's horn. Snails in the genus Anguispira, commonly referred to as the tiger snails, and Helicodiscus have ram's horn-shaped shells. Most North American snail species range in size from half an inch to 1 1/2 inches in shell diameter. A basic snail terrarium consists of a glass or plastic container with a tight-fitting lid, substrate, a food bowl, a water bowl and at least one hiding place. A flower pot turned on its side makes a good hiding place, or any smooth-edged container large enough for your snail to move around inside. Your container should have ventilation holes to allow for gas exchanges. The container doesn't need to be large. A 10-gallon container can suffice for multiple 1-inch snails. Because they're so slow-moving they don't demand much room to roam. Terrestrial snails from your own region won't need a heat source. Lights aren't recommended for snail terrariums. Substrate should be deep enough that your snail can completely bury himself in it. A layer of reptile mulch found in pet stores topped with a layer of pesticide- and fertilizer-free potting soil mixed with a bit of vermiculite works well. Snails need food, water and a calcium source. Terrestrial snails can be fed once a day or every other day. Remove any food your snail doesn't finish from the terrarium before it decomposes. The calcium source helps the snail build his shell. Cuttlebones sold for birds are an easy option. Most terrestrial snails thrive on a vegan diet of fruits and vegetables. Produce should always be thoroughly rinsed, cleaned and dried to remove pesticides or chemicals. To be extra safe, remove the skins from produce such as apples or carrots. Hard vegetables like carrots and potatoes should be parboiled and cooled before feeding. Snails make quick work of leafy greens. Bananas, berries and mangoes are also favorites. Frozen foods should be thawed before serving. A shallow dish of dechlorinated water should always be available to your snail. Make sure the water isn't so deep that your snail could drown in it. Snails enjoy bathing in their water dish. Mist the terrarium once a day with dechlorinated water to moisten the soil and surfaces. The terrarium should be cleaned once a week, removing all detritus and wiping down the walls and lid with plain, dechlorinated water. Remember that all cleaning solutions are harmful to your snail. Water and food dishes should be thoroughly washed twice a week or whenever dirty. Dishes can be washed with antibacterial dish soap. They should be thoroughly rinsed and allowed to dry completely before returning them to the terrarium. Decorations should also be wiped clean with water regularly. Certain fruits and vegetables aren't suitable for your snail to eat. In general, highly acidic fruits are to be avoided, such as tomatoes and citrus. Sharp objects are dangerous for snails. Avoid using very hard objects like terra cotta pots or ceramic dishes in the terrarium. If your snail falls and lands on a hard object, his shell can break, causing serious damage. Only keep more than one snail if you are prepared to deal with babies. Snails are hermaphroditic and in many species any two snails can copulate to produce viable eggs. How Long Do Aquarium Snails Live? What Do I Feed My Snails if I Don't Have Fish in the Tank? How Do Freshwater Snails Have Babies? What Are Snails Attracted To? How to Tell if Your Snail Is Pregnant?